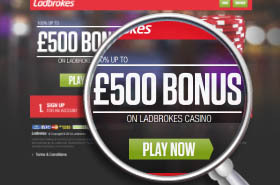 The brand name Ladbrokes is a synonym of security, a fair betting and gaming environment, timely payouts and above all tradition. Decades ago Ladbrokes started out as a brick and mortar sports bookmaker. The company has gone a long way and today it offers an array of gaming products, including a web-based casino, a mobile application and a Live Dealer feature. 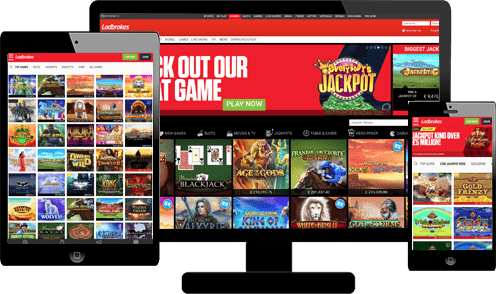 Ladbrokes’ gambling portfolio is so extensive that players are literally given the opportunity to pick from hundreds of slots, video poker, blackjack, roulette and arcade games. Each game is unique, yet all options have something in common – spectacular graphics, authentic sounds and user-friendly interface. The amazing visuals and sounds are courtesy of some of the leading software developers in the industry – Playtech, Microgaming and NetEnt to name a few. The brand Ladbrokes operates under licenses, issued by the UK and the Gibraltar authorities. Unparalleled diversity is not the only reason why, players from around the world stop by and register with an account at Ladbrokes. 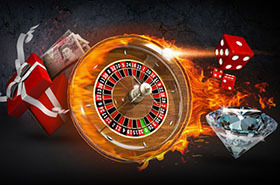 The operator’s generosity towards newly-registered players is simply unmatched, since Ladbrokes offers amazing welcome bonuses on players’ first three deposits. What better way to boost your account’s balance and tip the scales in your favor? Players’ third deposit can grant them up to £500, thanks to the 125% bonus match, Ladbrokes has on offer. There’s nothing easier than qualifying for this offer. 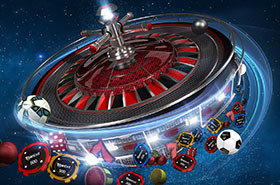 All there is to do is sign into your account and make a third deposit to play with in Ladbrokes’ Casino. Similarly to the other two offers from the welcome package, your third deposit should amount to at least £20 or the equivalent in another currency, accepted by the gambling operator. Keep in mind fund transfers and deposits conducted via e-wallets, provided by MoneyBookers and Neteller do not qualify for this offer. If you’ve deposited with one of the aforementioned methods, you will not receive the bonus. However, there’s no need to fret over it, as Ladbrokes works with a number of other convenient, secure and quick payment methods. These include PayPal, Visa and Maestro debit/credit cards, but bank transfers are also accepted. Naturally, certain requirements are imposed and must be complied with to receive the 125% bonus match. 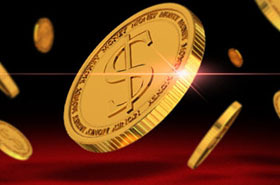 Players are required to wager the deposited sum and the amount they’ve received as a bonus twenty times. Here is an example – if you deposit £80, it will be matched with a £100 bonus. Then you must wager the total sum of £180 twenty times, so that your total wagers will amount to £3,600. Only then you will be allowed to redeem the winnings, you’ve accumulated, using the bonus. And another thing to keep in mind – the said wagering requirements must be met in the next 30 days. Otherwise the bonus will become inactive and will be removed along with all winnings, you’ve managed to accumulate with it. Also, the bonus cannot be used on any other Ladbrokes products, like its sportsbook for example. Your third deposit to Ladbrokes will earn you only one 125% match bonus, but you can use it on your smartphone, desktop computer or tablet.